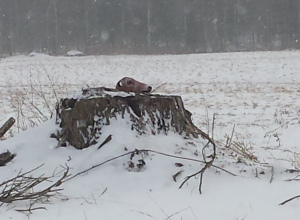 In case you can’t tell, that is a deer head sitting on top of a tree stump, and I see it on my way to work every day. Now, given that it has been there for months now with no change, and you can see daylight through a hole in it, it is fairly clear that it is not a real deer head, and I assume it is from some kind of target or something, but that make it almost creepier. In fact, the first few times I saw it, for just a moment I thought it was some sort of hellish deer creature hiding behind a stump and peeking out at me. So small mercies, I suppose. Anyway, I need to turn this into a story just so I can render it benign, so I’d best figure it out. ~ by smwilliams on March 4, 2014.